Expectations were high as racers from a record 40 different nations gathered in North Vancouver on a hot summer day for the launch of the 12th edition of the BC Bike Race. From seasoned pros to first time racers, road warriors to single track aficionados, the legend and global appeal of this seven-day stage mountain bike race continues to grow. More than 600 riders were on hand to register, each with a unique story, many from diverse cultures, but all sharing a love of mountain biking and sweet single track, knowing that the BC Bike Race delivers. After the mandatory pre-race meeting the racers filled buses bound for Horseshoe Bay full of anticipation. From there they boarded a BC Ferries vessel where the Vancouver Island mountains beckoned from across the Salish Sea. It was the beginning of a seven-day journey, along 300 km of hand-built singletrack and a huge helping of BC's soulful mountain biking culture, the communities that make it happen and the characters who keep the mountain biking stoke strong. Storm clouds gathered over Maple Bay on Friday as racers from 40 different countries noshed on a mountain of roast beef and mashed potatoes and collectively wondered - what tales from the trail lie ahead? Post dinner the more than 600 mountain bikers, along with the 200-plus volunteer and staff that help make it happen, were treated to welcome dances from the Cowichan Tribes, on whose traditional territory Day 1 would transpire. The Dance of the Wild Thunder caught the riders' attention, a song and dance that one of Cowichan elders told the crowd would be performed "to clear the path for all the bikers." Something to chew on for the riders as they tucked themselves into their tents for a good night's rest - or a restless night of anticipation. For some the path ahead would be a minefield of physical hurdles, for others the battle would be mental. And for others still, a punishing combination of the two. That's what mountain bikers call fun. And that's what forms the core of the worldwide mountain biking tribe, and the essence of the BC Bike Race. A love of digging deep and the joy of riding new trail where a new discovery lies around each corner. Participants were in for a treat. This year's edition of the BC Bike Race features a new Day 1 stage in the North Cowichan Valley, that had BCBR founders Dre Hestler and Dean Payne stoked as well as veteran BCBR participants returning for another multiday epic on some of the best singletrack BC - and the world - has to offer. 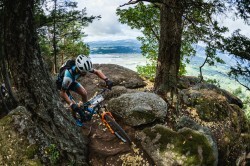 Though core Vancouver Island riders know it for the sweet singletrack Nirvana that it is, the North Cowichan Valley is an unknown quantity for most of foreign guests. This year's race is shaping up to be a battle among veteran elite cyclists. Rocky Mountain athlete Sam Schultz was back this year after succumbing to a fever in 2017 that forced him out of the day 6 Squamish stage. He was hoping to prove that baggy shorts, long hair and a moustache are no barrier to success on BC's infamously technical singletrack. "I might have spent too much time in the beer gardens last year," Schultz said, with a laugh, as he tried to calm pre-race jitters with another round of coffee. Kona team rider, and 2016 BCBR champion Cory Wallace was back looking for redemption, after also succumbing to sickness on last year's final stage in Whistler. Jeremiah Bishop, American XC racing legend, former Pan American Games gold medalist, and self described BCBR virgin, made the journey from his Virginia home base and was hoping to get a sniff of the podium on at least one of the stages. "I just want to have fun out there," Bishop said, pre race. And then there's defending champion Geoff Kabush. West Coast single track and this Vancouver Island born and raised, 2 x Olympian go together like beer and pizza. The question - would hometown advantage play into Kabush's favor again this year. Racers woke to near perfect conditions to tackle the 41km stage with a respectable 1692 m vertical gain. This new stage in North Cowichan would see the day broken into two mini timed stages - Mount Tzouhalem and Maple Mountain - linked by an untimed eight kilometer roll through rolling Vancouver Island countryside and orchards. Light overnight rain was just enough to give the trails some tack and keep morning temperatures ideal in the low 20s as cyclists set off on the stiff climb up Mount Tzouhalem above the base camp at Maple Bay Elementary School. By the time riders had sunk their knobby tires into some Tzouhalem dirt, their minds were on the task at hand and all memories of Director of Safety Brooks Hogya's graphic presentation on personal hygiene at yesterday's pre-race meeting were neatly filed away. The Grand Traverse allowed racers to sink into ascending rhythm, eventually delivering the pack to Field of Dreams, a signature North Cowichan trail that contours to the summit of Mount Tzouhalem. It was game on as riders entered Rocky Mountain Ridge, a playground of bedrock drops and punchy ups skirting the cliff’s edge, and winding through the dry arbutus and Douglas fir forests, with stunning views of Maple Bay far below, likely unnoticed by most riders. This sort of trail commands attention. Stage 1 's feature trail, Double D is a blue square, that offers up entertaining berms and rolls, where Kabush lead a tight pack of Quinn Moberg, French Lululemon pro enduro rider Francois Bailley-Maitre, Karl Platt, Sam Schultz, Kerry Warner, Jeremiah Bishop and Cory Wallace. After the Tzouhalem descent it was time to gather thoughts, fuel up and summon the reserves for the next hurdle - Maple Mountain. When racers pedaled through the totem pole arch of the Story trail at the base of the climb, the clock was back on and it was time again to drop into the climbing gears. This one's a doozy. A solid 7 km of consistent single track ascent with the occasional rock step and power move to make the lactic acid flow. You know the saying that it takes a community to raise a kid? Well the same can be said for raising a mountain biking scene. The Cowichan Valley embodies the evolution that many rural BC towns are going through; from boom and bust raw resource towns towns to places where the recreational and cultural assets are just as important. The Cowichan Valley Trail Stewardship Society has been at the forefront of putting the community on the destination mountain biking map. Last year they decided they were ready to welcome the world and started talks with BCBR. A few group rides early last fall with the BCBR crew was enough to demonstrate that the North Cowichan had the goods to host an incredible stage. "We've been working hard since last fall, putting our sweat into these trails," said Chris Istace, one of the stewardship society directors, who was on course shuttling photographers around to key locations to capture action. Just as the Cowichan Tribes gave riders a warm welcome, local members of the Dirt Divas mountain biking club were also on course in full hoser regalia giving foreign riders a dose of iconic Canadiana: hockey sticks, beer, maple whiskey, toques and humor, just when they needed it most. At the bottom of Maple Syrup a renowned epic descent, it was looking more and more like a duel between Kabush and Schultz, between lycra and baggy pants. And the unstoppable Katarina Nash had a comfortable lead on first time BCBR participant and Clif Bar athlete Hannah Finchamp. And that's the way these leaders would complete Stage 1 rolling across the finish line, with Kabush and Schultz claiming 1-2 respectively, while Frenchman Bailley-Maitre pedaled across in third place. The stage was being set for a fine weeklong battle on the single track.